The KitchenAid 9-Cup Food Processor with ExactSlice System easily slices soft to hard foods with the optimized speeds, from thick to thin. The 3-in-1 Ultra Wide Mouth Feed Tube accommodates a variety of sizes of food. Immediate payment of C $130.62 is required. Haven't had a chance to use it a lot. Very substantial, not too light. 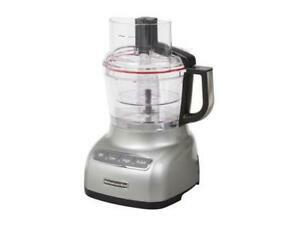 Much more powerful than my previous 30 yr old food processor. Very nice machine. This is a grate (pun intended) food processor!